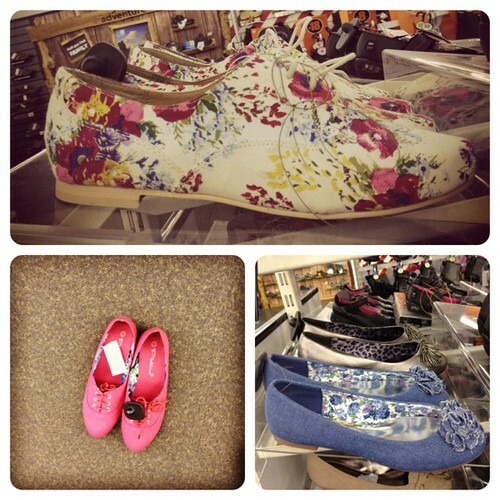 Strawberries and Buttercups: Shoes Again! I bought my shoes around October and November time and thought they would last me until next year even though I've pretty much wore them everyday but lately I suspected that they were letting rain water in from the sole but wasn't sure until last week when my niece and I were coming back from the supermarket and it was pouring with rain. I came home to the soggiest socks... urgh! I just find it so disappointing but I guess I got my monies worth. I decided I'll go to a store down the road that sells shoes to get some really cheap ones to last until my summer holidays at least since its not guaranteed that the weather will start to get nicer and I'll be able to wear my fancier footwear. Unfortunately I didn't find anything even though I saw some really nice footwear... the pink pair my niece wanted me to wear but I was late in responding so she put them on the floor and bent down to attempt to take my shoes off. I had to tell her I liked them but didn't want them as I wanted only black ones. I did however get 2 bags which I'll have to photograph at the weekend to share with you... they were such a bargain compared to others that I'd seen so had to snap them up.... at least I got something out of my journey there. This store has quite fond memories from my childhood, in those days it was on the same ground as the supermarket and was originally in a building that once housed a cinema. I remember when going to nursery the windows were lined with wellingtons of all colours which I loved admiring whilst walking along the ledge to get closer. Once in the store I used to go between the shoe racks to get a closer look at all the tangled strings and shoes. The supermarket owner ended up buying all the land and shops which were knocked down, it is all car park space and part of the main road. Have you made any great purchases lately or maybe you'd had something fall to bits that needed replacing? I'm lucky in that sense as I wear both but mostly flats because its easir for work.